Weekend of Fun in Store with Ohio Homecoming July 5-7! This post is written by Bruce Wimbish, Communication Director for the Greater Columbus Sports Commission. Columbus’ 4th of July Celebration doesn&apos;t end with Red, White, & BOOM ! 200Columbus is proud to present, Ohio Homecoming, a multiple-day festival new to Columbus as part of the city’s Bicentennial celebration in 2012. 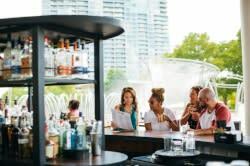 After starting in Cleveland for two years, Ohio Homecoming will come to the state’s capital looking to build civic pride while providing unique entertainment options for the entire community to enjoy. From July 5-7, the 2012 Columbus Bicentennial edition of Ohio Homecoming will feature a “DJ’s in the Park After Dark” community party, a college fraternity & sorority step show, an exhibition basketball game at St. John Arena between NBA and professional basketball players from Columbus and Cleveland, and in finale, a FREE concert featuring Sugar Foot’s “Ohio Players.” Tickets for each marquee event are on-sale online at www.ohiohomecoming.com . On Thursday, July 5 at Genoa Park behind COSI from 8 p.m. to midnight, Ohio Homecoming will host its official kick-off event with “DJs in the Park after Dark ,” presented by Homage, featuring live music from eight of Central Ohio’s Top DJ’s along with food trucks and a Homage pop-up shop featuring some of the best local vintage t-shirts. Tickets are only $5 in advance and $10 the day of the event. On Friday, July 6 Ohio Homecoming will host the “S.T.O.M.P. to the Ballot ” College Fraternity & Sorority Step Show, presented by The National Pan-Hellenic Council of Columbus, at Genoa Park behind COSI from 6-9 p.m. A tradition on college campuses around the country, stepping is a rhythmic form of communication shared by many and for the first time in the central Ohio region, many Greek organizations.. Tickets are $15 in advance and $20 the day of the event. On Saturday, July 7 Ohio Homecoming will host the Battle for Ohio! Celebrity Basketball Charity Game presented by NFL Player Lee Evans, Verizon Wireless Zone and Li-Ning on Saturday, July 7 from noon-3 p.m. at St. John Arena. With the support of The Ohio State University, the OSU Athletic Department and the OSU Alumni Association, former Buckeyes who have played professional basketball in the NBA or internationally including Evan Turner, David Lighty, Jon Diebler, Scoonie Penn, Dallas Lauderdale will be joined by other NBA and professional basketball players, including Cleveland Cavalier Tristan Thompson in a “Team Columbus” versus “Team Cleveland” intrastate rivalry game. Doors open at 11 a.m. and tickets are $15 (general admission), $10 for OSU alumni, all college students and groups of 10 or more and $5 for children ages 10 and under. 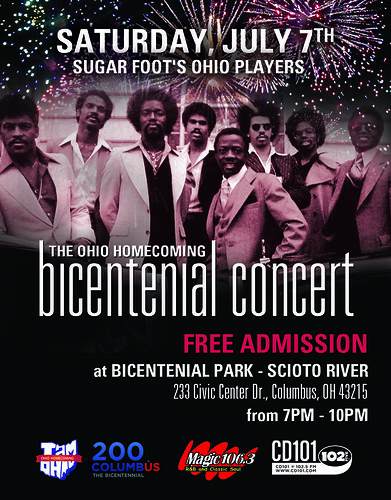 In finale, Hollywood Casino Columbus presents THE concert of the summer with The Ohio Homecoming Bicentennial Concert featuring Sugar Foot&apos;s “Ohio Players.” Radio One’s Magic 106.3 and CD101 are also participating partners of this FREE concert, which will be held at Bicentennial Park along the Scioto Mile on Saturday, July 7 from 7-10 p.m.
Come out and join in the fun on Columbus’ 200th summer with Ohio Homecoming!